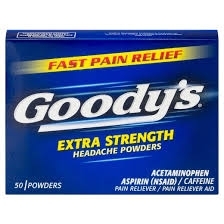 For all your minor aches and pains, no matter when you’re hurting, Goody’s® products have the right formula to stop pain fast. Remember, there’s fast, and then there’s Goody’s® Fast™! Do not take more than directed (see overdose warning). Adults and children 12 years of age and over: Place 1 powder on tongue every 6 hours, while symptoms persist. Drink a full glass of water with each dose, or may stir powder into a glass of water or other liquid. Do not take more than 4 powders in 24 hours unless directed by a doctor. Children under 12 years of age: ask a doctor.